What is “Revista de Mediación”? This article describes the In-Court Family Mediation Service of the Malaga Family Court since it was created in 2000 to date, and how the Court has evolved over the last 14 years. Some of the aspects contained in this article are: the Court’s articulation within the a Programme set up to improve the judicial management of family conflicts; the legal and organic coverage of this kind of services in Family Courts; its structure; and the results obtained. Analysing this experience shows that using mediation in family processes always generates positives results for the judicial system and for the concerned parties, regardless of the fact that agreements are achieved or not. Psychologist and Mediator. Psychologist and member of the Team of Experts in the Malaga Court. 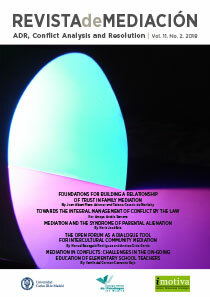 It is an academic, biannual, online, and free of charge journal on Mediation and other ADR, of high editorial quality, highlighted relevance and professional interest that encourages scientific study and rigor, best practices and innovation, analysis and positive resolution of conflict through alternative and peaceful ways (ADR). It is addressed to mediators, specialists in conflict analysis, management and resolution, and to those interested in these fields. 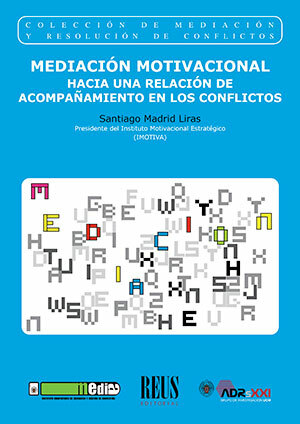 The “Revista de Mediación” management team considers the best authors and the most updated research projects that might be of interest for the entire mediation practitioners. Having quality papers is, ultimately, the main criterion to decide upon publication. In order to accurately respond to the professional principle this Journal aims at, we consider that it is appropriate to meet some requirements other publications, publication standards and writing books have in order to insure the relevance of the published topics. If you wish your article to be assessed for publication by “Revista de Mediación” please send the following documents to the email revistademediacion@imotiva.es templates can be downloaded here.